to the Rio Grande Valley Chapter of the Blue Star Mothers of America, Inc. which is a non-partisan, non-political organization. We do not support any political candidate nor do we endorse any religious organization. The military represents all aspects of America as does our organization. Links to our website do not represent an endorsement. Our Chapter 2, had its first meeting in June 2004. Our membership continues to grow and we invite you to attend one of our meetings which are held the third Saturday of every month at 9:00 AM. We meet at the New Mexico Veterans Memorial Visitors Center, 1100 Louisiana Blvd in Albuquerque. Membership is open to mothers who have sons or daughters serving in the military whether deployed or not, and to dads, other family members, and friends. We are a support and service group joining together to share our concerns, worries, our pride, and our devotion for our loved ones serving in all branches of the Armed Forces of the United States. 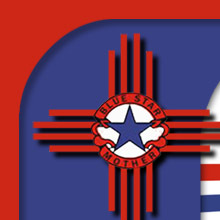 We are an official chapter of the Blue Star Mothers of America, Inc., a group formed during World War II. Additional information is available at the national website.